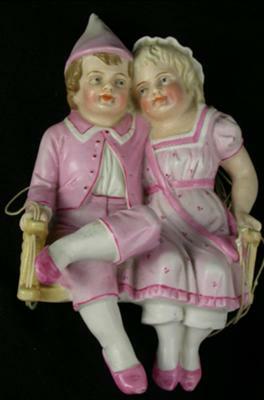 Pottery mark Query - Blue 'R' inside Blue Diamond:- Bisque figurine of two children on a swing. Holes in swing with string. Additional markings are impressed numbers. Underneath that, impressed "C7" or "G7"
Purchased at an estate sale. I've looked everywhere and cannot find this exact marking. It appears German to me, but I'm no expert. This is nice, but very possibly modern and not as it appears. Read the comment threads for more information. Many thanks for submitting, great photos of a fantastic bit of what looks like antique German artwork. Really characterful and very nice, in my view. In theory, this mark should be one of the more easy ones to look up. The maker has some design quality even if the make might be somewhat less so, the mark itself is not a one of the overused ones like a crown, it has a very clear and simple letter 'R'. However, despite looking in my books and online, I can't find an obvious maker at the moment. I will keep trying and also hope this gets seen by someone who knows. Printed Blue Diamond with Capital Letter R, impressed "No. 209" and "38"
A blue diamond, with an R inside, in what I think is referred to as "undercoat blue." Handwritten, in black ink, "67," the 7 being "crossed," European-style. I thought it looked as if it might be German, but my relatives were of British/Cornish origin, and "No." for number is an English abbreviation. Red Fox lying with small bunny in front of two tree trunks of different heights. Each trunk is a vase type container. There is a small pool type bowl on the right of the trunks. In theory it seems to function as a cigarette holder, match holder, & ashtray. Marked with the same blue diamond r mark. Impressed with No. 284, also 67 . Painted in red orange, browns, greens, etc. in matte finish. I have not found the maker ID. Just made a connection in my mind. We just had a professional appraisal go through to my expert team which I thought looked very much like the bisque style of little known but lovely 19th Century Parisian makers Vion et Baury (blue VB impressed sprig mark). V & B made nice figurines to our eyes but not quite as nice or as high quality as the person whose studio they took over - a fabulous sculptor named Jean Gille (Jeun) (blue JG impressed sprig mark). Totally fabulous figurines. Then it's reported in various places online, but not in any books I can find, VB later did a green anchor mark on more mass produced wares. Then, on 2 threads on this site, people posted very V & B looking figures with a gold anchor mark. To find the threads, use the search box top right. Now, on close inspection, the painting of the 19th Century V & B is different to the later 'anchor' marked production in that the faces are more nicely detailed than the later production and so are the details of the background rocks and other small details. The item I sent into the expert recently (a figure which looked identical to the figures purporting to be Vion & Baury with the anchor marks) had a diamond mark which was somewhat similar to this mark above, but so smudged it could not be made out properly. But I think it is the same one. It was a nice figure, don't get me wrong, nicely painted by our eyes, especially when you compare it with mass produced tat we see from mid 20th century onwards. But not as good as real V&B, which, in turn, is not as good as Jean Gille. The expert was very adamant the figure I sent in was 20th century - post-war 1950's. He didn't commit to a country, but I guess it could have been either Japan or GDR (East Germany). So, looks like the figures with the anchor mark, some are saying are V & B 19th Century may be nothing of the sort. SO WATCH OUT IF YOU ARE BUYING! Get an expert opinion before committing. See our photos below. Our professional expert was sent the last one by a clinet and said it was painted in the mid to latter part of the 20th Century, and NOT in the 19th century. In my view this allies the face to the green anchor marked face, and also DUNE'S ORIGINAL PHOTOS at the top of the page. Therefore Dune's items and all the other poster's items as well as the green anchor mark items, would be all mid to late 20th century pieces, carefully made to look as if they are 19th century. Does this make them reproductions or clever fakes? It all depends whether or not the intention was to deceive. Samson of Paris made reproductions which are now worth quite a bit - he marked his wares with his own marks. However, he sold his wares to retailers who were known to pull the wool over the eyes of their clients. This makes Samson very grey. This is a grey area. I wanted to add to this discussion on the blue diamond markings with R in the middle. I have been collecting bisque figurines for about 20 years . I have examined thousands of these at shows and shops and have bought several hundred over the years. I own about a dozen of the Blue capital R in a Blue diamond. Most have intaglio eyes and are marked with with impressed mold/inventory numbers and painted artist numbers. I feel that they are older and not modern. The painting is very good and the feel of the bisque seems correct. There is a lot of great detail. The quality is similar to ones I own, that are marked with the RW in a partial diamond with crown on top and Germany. Rudolstadt is below the mark. Often referred to as Royal Rudostadt by many collectors. Most of the lovely older figurines were not marked all. 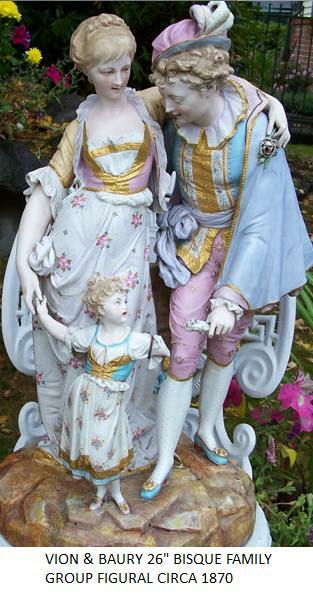 One of these Blue diamond figurines is pictured in the book, Children figurines of Bisque and Chinaware, by Elyse Zorn Karlin. It is 13 inches tall and she values it at $100-175 in her 1990 published book. Perhaps they were made for the American market 1900-1920. They certainly appear to be European and most likely German. I have included pictures of the above mentioned figurines in my collection. Many thanks for adding your weight of knowledge to this discussion. On the one side there is the resident ceramics expert for this site (who does the paid for valuations) stating very firmly that these blue diamond 'R' figures are clever copies in the older style, produced sometime in the 1950's or 60's (or even later). This person is a very experienced general ceramics expert and knows his onions. On the other hand, there is you with your very specialized knowledge of this style of bisque figurines, saying you think they are early 20th century. You said Elyse Zorn Karlin mentions them in her book, but you didn't say if this author identified a date (if she did, presumably she would have some concrete evidence to back that up rather than guesswork). In my view, these figures definitely had the look of late 19th century/ early 20th century to them. I was surprised when our expert dated them as modern era reproductions (particularly as the cursive script of the impressed numbers looked very authentically Victorian/Edwardian - I wouldn't have thought modern makers would have bee able to reproduce such an authentic small detail as that). However, this is just the area of uncertainty the makers and marketers of reproductions like too operate in. Many thanks for your input, I am looking forward to hearing some real concrete evidence of the real age of these items. Printed Blue Diamond with Capital Letter R, impressed "No. 273" and "6"
Hi! I have recently acquired a large (12" - 13") pitcher with the same Blue 'R' in Blue Diamond printed pottery mark. It also has an impressed 'No. 723' and an impressed '6' along with a couple of other printed marks. It belonged to my great grandmother and my dad remembers it as being in his grandma's house when he was a boy. She was from Texas and was born September 20, 1892 and died May 17, 1964. Since there seem to be quite a few items out there with these Blue 'R' in Blue Diamond marks, why is there apparently no information about the maker available (even if they ARE all reproductions)? 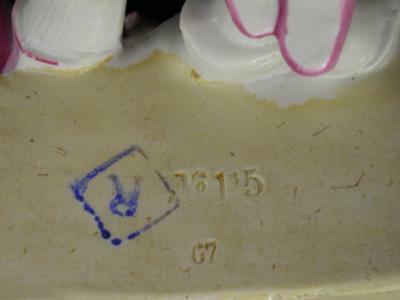 This is the only thread I can find (it's even referenced in other pottery forums when someone presents a pic of the mark). My father in law, from Texas, gave us a 16" pair of bisque figurines with the blue R in a diamond mark and impressed numbers years ago. His parents had these in their house in Texas when he was young. He was born in 1918 and these were certainly there by the 1930's. I too have a figurine with this mark, It was my grandmother's (born 1902) and was given to her as a child by her grandmother. My mother remembers it from her childhood (she just died at 90) and I remember it when I was a child and I'm 60. I do not think these are reproductions. I would love to know the maker that has us all perplexed! Kathy, the piece in your second photo, fourth from the left, is just like my figurine of a boy, excepting that my boy's clothing is blue, rather than pink. He came with a figurine of a girl in pink, "Pinkie", and he was referred to as "Blue Boy." 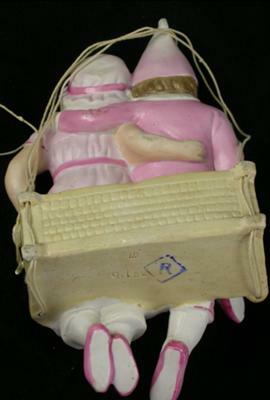 "Pinkie" was broken when my mother was a child, and "Blue Boy" came to us when my mother's aunt died. My mother's memories of them are from the 1930's, so we know that he is at least that old. Thank you for your comments!! I also have a piece with a royal blue R in a blue diamond and a number pressed into the bottom. It's a jug/pitcher with cherubs in relief harvesting grapes. The background is a delicate, light blue. Very pastoral, with vines on the handle and around the lip. My grandfather had a large collection of Haviland china from the early 20th century. I suspect this piece is European, and from the same time. It seems odd that no one can identify the mark. I have two urns with the mark. They are not figurines. My piece cannot be a late 20th century fake, because it was already in the family at least as early as 1930. I have the figurine of the two children fighting that Kathy has in her photo (2nd from left). It belonged to my grandmother, her mother gave it to her circa 1918 (she was 11) because my grandmother and her sister always fought and this reminded her mother of them. My mother remembered it always sitting on my grandmothers dresser (mom is 92) and I remember it always being around (I'm 63). So I am sure these are older and not reproductions! Such a mystery!!! I am looking for the maker of my Seasons figurines with the same mark. They are 16" tall, with very finely modeled features. (Much more detail than the photo of the children from the original query. )They are bisque porcelain with hand drawn patterns on their clothing. They also have impressed marks of "No.725" and an impressed small "24". There is a blue hand drawn "14", which reminds me of an artist's mark from the factory employee who colored the figures. Thanks for any info you may have! Peter it is evident that you have little experience with bisque figurines, for which you are certainly forgiven! Most of the pictured examples in this thread are from the last quarter of the 19th century. Now, I am not defending the quality of design or desirability of such objects as the market has certainly shifted for this type of product. I however would rather place sharp objects in my eyes, therefore providing me with the lack of vision to suffer these beasts. I am 35 years in the antiques trade and one of five generations both sides of the Atlantic, it has been my passion and also my curse! My father said the family should have found wisdom after four generations, sadly this did not occur and the disease continues! My advise though; don't provide advise if your knowledge is insufficent! Anyway all that being said I reckon that most of these german bisque figures would be better served at Greek wedding ceremonies, as they crash and break of the dance floor as the bride and groom dance. My previous description and inquiry was in reference to my figurines which were purchased from my long-time friend. Her husband's family owned them before me, and can attest to their age. The latter 19th century would be the correct time frame for the great-grandparents who originally passed them down. I am startled to see the disagreement about their origin, and would be inclined to think that any manufacturer who creates porcelain with this much care in the modeling and coloring, can ask high prices regardless of age. A "modern" company would need skilled labor to produce this quality and would certainly charge appropriately, eliminating the need to obfuscate the provenance of their wares. Join in and write your own page! It's easy to do. How? Simply click here to return to 8. China Chat - Current Unsolved Pottery Mark Investigations.